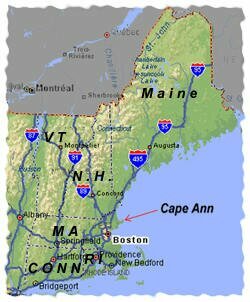 Cape Ann (comprised of Gloucester, Rockport, Essex and Manchester) is located in the northeast corner of Massachusetts, just south of the New Hampshire border. We are approximately 30 miles north of Boston. The major highway leading to Cape Ann is Route 128. There is also a coastal road that circles the coastline of Cape Ann, which is Route 127. Most of our dive sites are located just off Route 127. From the Boston area take Route 128 North to Gloucester, continue on 128 straight-through two traffic circles. At the first traffic light you come to, take a left onto Route 127. Drive 1/2 mile until you reach the Cape Ann Marketplace on your right. Turn right into the Marketplace, and we are located to your right.